Blicx Ltd, the market research agency, announces the launch of its syndicated eSports Brand Leader Score survey. The aim is to identify the leading brands in the global eSports market measured by an attraction score from the eSports crowd. eSports has shown an explosive growth. An increasing number of consumer brands join the already well established eSports brands in the quest for the hard to reach Millennial audience. “Brands need to be authentic in eSports and add value to the community; otherwise they will be instantly rejected and ignored by this audience. We have developed the eSports Brand Leaders Score as a tool for brands to understand if they are being perceived as a real eSports brand by the crowd.” Philipp Wagner, Research Director and founder of Blicx Ltd said. 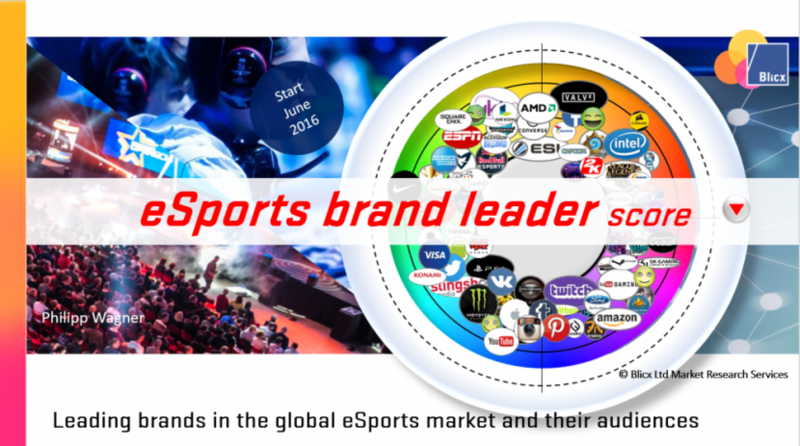 The eSports Brand Leader Score gives established brands a KPI performance analysis and a systematic opportunity overview for brands which recently entered or consider entering the eSports market. It is also a valuable tool for ad agencies and media for a better understanding of potential partnerships in the highly fragmented eSports scene. The eSports Brand Leader Score is based on visual association rating and was developed together with Dr. Aly Sabri, an expert in neuro marketing applications with a PHD in medical studies in Oxford & Harvard. Blicx deploys a gamification research approach based on mobile survey feedback with swiping features which Millennials are used to in their digital life. The survey kick-off date is June 15th, please get in touch for more information on how to participate with your brand. About Us: Blicx Ltd. was founded in 2009 and is a market research house providing quantitative and qualitative research services in the video game industry. The team has extensive experience in social community research by working with some of the industry’s largest video game publishers with their global communities of passionate gamers.